In last night’s Dota Asia Championships, the home-crowd team LGD Gaming was in a bit of a bind against Virtus.Pro. The high ground of their base was broken and VP was knocking on the door, but LGD did have one thing left: the element of surprise. Hiding in Roshan’s pit was a single Dire siege engine, which a member of LGD had taken control of using a Helm of the Dominator and left in the cave. Usually, that’s just another way of keeping tabs on the ancient beast Roshan, who drops a second-life-giving aegis on death. But LGD makes use of Dota 2's laundry list of mechanics and interactions to instead get the drop on Virtus.Pro, sneaking behind enemy lines to start a team fight the visiting team was not prepared for. LGD’s Yang “Chalice” Shenyi was playing the Underlord, a massive beast of a hero that can make fire rain from the sky and decays enemy damage with his aura of atrophy. 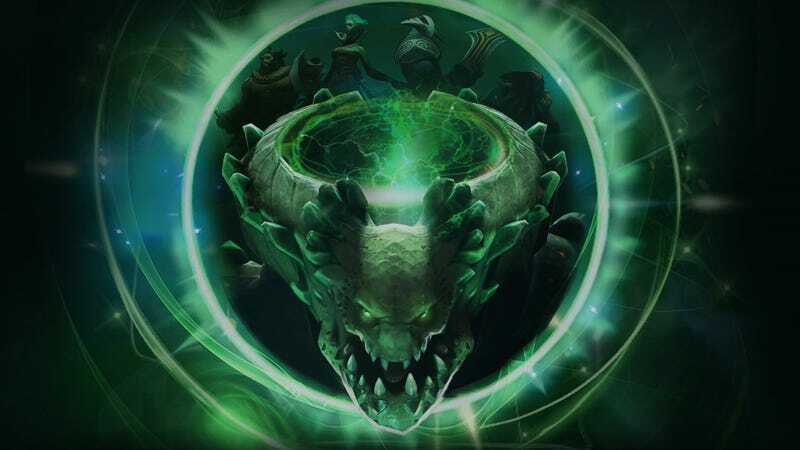 His ultimate, Dark Rift, opens up a circle around him and, after a short time, teleports him and any friendly units inside to whatever unit he targeted with the rift—in this case, the siege engine hiding inside Roshan. After popping a Smoke of Deceit (which obscures vision of your team from wards and other minions, but breaks when you come too close to an enemy hero), LGD sees VP isn’t right outside their base anymore and starts up the rift. You can even see Virtus.Pro use its scan to spot that LGD have smoked and moved outside of the base walls, and then back off towards the pit area, completely unaware of the trap about to be sprung on them. LGD busts out, picks off two heroes right away, and then takes the fight to the transforming cores of VP with the numbers advantage. A brilliant use of Dota 2's blend of mechanics to make a big play. With that win, LGD toppled the current leader in Dota pro circuit points and ensured a China vs. Southeast Asia finals. Unfortunately for the home crowd in Shanghai, LGD fell in a close 3-2 series in the grand finals to Mineski. A second-place finish still guarantees them a significant amount of pro circuit points though, and almost as important, a classic play that can be added to the annals of Dota 2 history, next to the many echo slams, dream coils and black holes that dot the pages.